The Chicago Southland Convention and Visitors Bureau, the official destination management and marketing organization for the area’s 63 south and southwest suburbs, recently announced the release of its 2019 Visitors Guide. The 88-page guide is filled with numerous activities and venues in the area. It contains a wide variety of things to see and do for residents and visitors alike, including getaway ideas, interactive fun for kids, nature centers, golf courses, festivals, sporting events, concerts, ideal fishing spots, local attractions such as Lincoln Highway and the Richard Haas murals, and more. To order a copy or view the guide online, visit www.visitchicagosouthland.com/inforequest. For more information, call 888-895-8233 or send an email to info@visitchicagosouthland.com. South Suburban College announced that Board Chairman Frank M. Zuccarelli recently received the Illinois Community College Trustees Association Service Award. Zuccarelli was recognized for his 40 years of dedicated service to the SSC Board of Trustees, Community College District 510 and the Illinois Community College System. A South Holland resident, Zuccarelli enrolled at SSC — previously known as Thornton Community College — in 1974, and earned an Associate of Science degree in 1976 and an Associate of Arts Degree in 1978. He was then elected to an unpaid post on the SSC Board, also in 1978, and was chosen by his peers to be Board Chairman in 1987. Zuccarelli has served in the same capacity ever since. 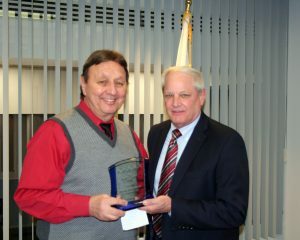 In addition to his role at SSC, Zuccarelli has served as Thornton Township Supervisor since 1993. For more information, call 708-596-2000 or visit www.ssc.edu. The village reported that Pita House recently hosted a ribbon-cutting ceremony for the grand opening of its new restaurant, located at 300 W. Higgins Road. The restaurant was previously located at 365 S. Roselle Road until ownership invested approximately $80,000 to renovate the existing 4,800-square-foot space on Higgins Road. Pita House offers a large selection of traditional Middle Eastern fare, including entree items such as chicken shawarma, falafel, kabobs and numerous vegetarian options. Restaurant hours are 11 a.m. to 10 p.m. Monday-Thursday, 11 a.m. to 11 p.m. Friday and Saturday, and 11 a.m. to 10 p.m. Sunday. For more information, call Pita House at 847-352-4750 or visit www.pitahouse.com. The city announced that it will offer cholesterol screenings at a discounted price of $15 (normally $20) in recognition of National Heart Awareness Month. The screenings will be held from 8:30-10:30 a.m. Feb. 9 and Feb. 13 in the Health & Human Services Department, located on the first floor at Village Hall, 33 S. Arlington Heights Road. The Lipid Profile Screenings require a 12-hour fast. Also included are tests for blood sugar, blood pressure and weight with BMI and body fat analysis. To schedule an appointment, call 847-368-5760 or send an email to healthmail@vah.com. For more information, visit www.vah.com. The village announced that a report by financial news and opinion site 24/7 Wall Street has proclaimed Winnetka as “the best town to live” in Illinois. Criteria for judging included characteristics deemed “universally desirable” to determine what makes a place “home,” including safe streets, a strong local economy, diverse entertainment options and more. Researchers used a weighted index of more than two dozen measures in four categories: affordability, economy, quality of life and community to identify the “best” cities/towns in each state. The 24/7 Wall Street report noted that more than a quarter of Winnetka commuters take public transportation, and that the village, “boasts four beaches, a boat launch, several parks, a tennis club, golf course, ice rink and forest preserve areas — all open to the public.” For more information, call 847-501-6000 or visit www.villageofwinnetka.org. The village announced that the Community Character Coalition of Elk Grove will hold its third annual Carnival of Exceptional Character from 5-7:30 p.m. Feb. 23 at the Elk Grove Park District Pavilion, 1000 Wellington Ave. The event includes free food (while supplies last), free games (Bozo Buckets, Strike-A-Light, bocce, ring toss, dog tags) and prizes, a bounce house and more. Attendees can also learn about the village’s various community service groups. Admission is free. For more information, call 847-357-4000 or visit www.elkgrove.org.